Let me just say, that dive made this entire trip to Kona worth it. Seven massive rays, flying around, brushing (or knocking into) the top of our heads, twirling, dancing, feeding... it was absolutely amazing. The pictures and video just don't do it justice. While I can't say it's my best dive ever, it was amazingly unique, wonderful, and an astounding experience. The dive just reinforced to me why I like Jack's. Their crew are great, with a great attitude, the dives they choose are wonderful, and I can't understate that anyone going into Kona NEEDS to do one of these dives. Reading this is just a great timing indeed. 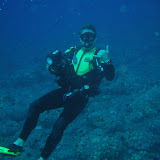 I am looking forward to my trip to Kona this summer to try out these dives. I cannot hide my excitement.